Call it Sagehen submersion. Twice a week, first-year students participate in one of 30 Critical Inquiry (ID1) sections—intensive classes that introduce new students to both the joy and the rigor of academia at Pomona. 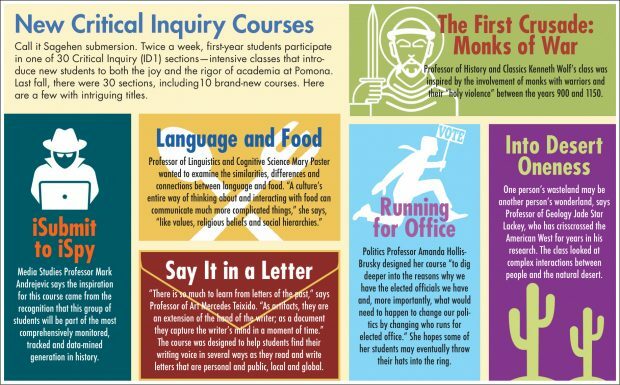 Last fall, there were 30 sections, including10 brand-new courses. Here are a few with intriguing titles. Media Studies Professor Mark Andrejevic says the inspiration for this course came from the recognition that this group of students will be part of the most comprehensively monitored, tracked and data-mined generation in history. “There is so much to learn from letters of the past,” says Professor of Art Mercedes Teixido. “As artifacts, they are an extension of the hand of the writer; as a document they capture the writer’s mind in a moment of time.” The course was designed to help students find their writing voice in several ways as they read and write letters that are personal and public, local and global. Professor of History and Classics Kenneth Wolf’s class was inspired by the involvement of monks with warriors and their “holy violence” between the years 900 and 1150. Politics Professor Amanda Hollis-Brusky designed her course “to dig deeper into the reasons why we have the elected officials we have and, more importantly, what would need to happen to change our politics by changing who runs for elected office.” She hopes some of her students may eventually throw their hats into the ring. One person’s wasteland may be another person’s wonderland, says Professor of Geology Jade Star Lackey, who has crisscrossed the American West for years in his research. The class looked at complex interactions between people and the natural desert.